UFC 181 from the Mandalay Event Center in Las Vegas,NV is going to be one hell of a show. For the Co-Main Event we have the coaches from this seasons UFC Ultimate Fighter squaring off for the UFC Lightweight Championship. If you’ve watched the show at all this year, you have been able to tell these guys haven’t spent much time around each other, and this fight is the reason. Pets is going to do whatever he can to pick Melendez apart with his combinations and Melendez is going to be shooting for those legs to take this fight to the ground. UFC 181 is going to be a treat, lets take an in-depth look at both these fighters. Let’s get straight to it, Melendez is going to want to take this fight straight to the ground. Lets be clear though, I’m not touting Melendez as having a ground game that’s second to none, but his chances of winning this fight significantly spike if he does. Here is the counter argument to that though, Melendez has proven to have a sturdy chin and he can take many of the punches Pettis is going throw, but utilizing the mat is going to be able to keep him there till the end. 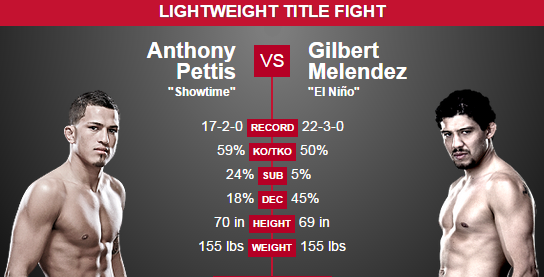 If Melendez is able to control this fight he just needs to stay as close to Pettis as he can at all times. Pets won’t allow the fight to be solely on the mat, so when that happens Melendez needs to get in close and take away the technical striking abilities Pettis has proven he has. Here’s my advice for Melendez, tire him out. Take Pettis to the ground, make him work, let him up and do it again. Stay close often and don’t let Pettis has the space he needs to utilize his skills. Melendez can win this fight, he’ll just need to stick to his fight plan and never waiver when pressure mounts. This guy is tough, I mean like really tough. Just ask the “Cowboy” or Henderson and they’ll tell you exactly what this guy is capable of. Pettis can pick apart any defense with his technically striking ability. Pettis is also wildly unpredictable. He’ll show us his skills from his feet in round one, and on the mat in round two. He’ll work you towards the center with his quick jabs and extremely quick footwork, then throw a one-two, and that’s it, fight over. Pettis is going to want to keep this fight on his feet though. Pettis doesn’t want to get caught wasting energy on the mat and end up fighting for his life in the fourth and fifth round. My advice for Pettis is to keep your space and move. Pettis is powerful but only when he sees his spots, which is what make him so dangerous. I see Pettis trying to end this one quick and put all of the trash talking to bed. A Five-round slug fest is great for ratings but only good for a select amount of fighters, and Anthony Pettis isn’t one of them. I know he’s healthy but everyone has there limitations. Pettis will look to end this one before it begins. He doesn’t want to get caught in the fourth and fifth rounds with Melendez who has shown great final round stamina. If Pettis is able to keep his space in the early going and use those powerful technical skills we have all seen, Melendez won’t make it past the second round. I see Pettis coming out with serious aggression and ending this one in the second round. He’ll wear down the striking defense of Melendez in round one and two and finish him off in the third by an exciting TKO. Prediction: Anthony “Showtime” Pettis by Third Round T/KO.